Bake From Scratch’s assistant editor Lillie Mermoud shares memories of her grandmother’s cherry clafoutis. We reimagine the classic with a chocolate and poached pear twist. 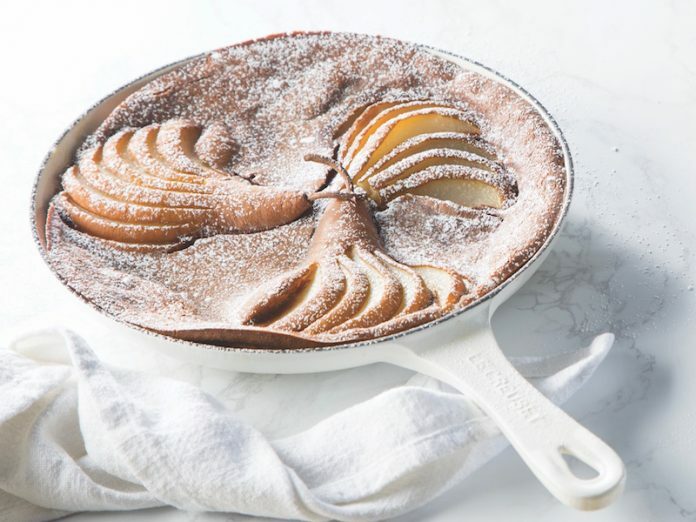 Find the recipe for our Chocolate Pear Clafoutis in our 2019 March/April issue! In France, when a dish is described as à l’ancienne(old fashioned manner), you know it’s going to be good. 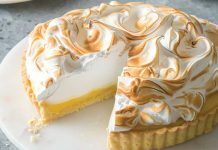 A dessert made à l’ancienne is traditional, simple, and maybe even a little rustic. Above all, it is dignified. 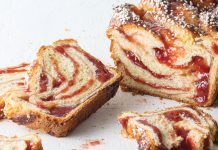 Often using only a handful of high-quality ingredients and a decades-old method, these recipes are handed down through generations to stand the test of time. My mamie’s cherry clafoutis is made à l’ancienne. I grew up in Paris, France. Every Sunday, my family and I would have lunch at my grandparents’ house in Antony, a suburb just south of Paris. Their house had colorful stained glass windows facing the street, and tufts of lavender framed the front walkway. The neighbors’ cherry tree towered over the house from an adjoining garden. During springtime, the blooms burst in vivid pink, and to me, that meant one thing: cherry clafoutis. As soon as we pulled up to the house, my grandmother, whom we called Mamie, would run out to greet and usher us to the dining room to begin the five-course meal she’d prepared. We’d dine on white asparagus and hollandaise, roasted pheasant, and a cheese plate stacked with Reblochon from Savoie. For dessert, Mamie would bring out her signature clafoutis still warm from the oven. The silky custard filling brimmed with juicy cherries that, as is the tradition, my grandmother never pitted. The pits gave the clafoutis its defining nutty almond flavor. This recipe has been in my family for generations. Mamie never changed it because she never needed to. Five years ago, I moved to Birmingham, Alabama, to attend college. To combat homesickness, I bake familiar French recipes. I doubt I’ll ever be able to top Mamie’s clafoutis, but with every bite of French desserts made à l’ancienne, I’m transported right back to those Sunday afternoons in Antony.